Does your Slatwall match the feel and image you're looking to create in your store? If it doesn't, it's probably because design costs and the high cost of custom panels have kept you from creating the exact look you want. 3D Slatwall Panels solves that very problem. Customize your walls with Textured Slatwall to create a different atmosphere and feel. Covering a whole wall with Slatwall hides the inserts from unsuspecting customers. 3D Slatwall is an upgrade and unique from the Traditional Slatwall. Find texture and design like Wood, Brick, Metal, or even Tire which gives depth and enriches your walls compared to Traditional Slatwall. Ever thought about renovating or changing your store but didn’t know what? Textured Slatwall will make the biggest impact with little effort because of the simplicity and easy installation. If you have Traditional Slatwall Panels, reuse the same accessories like hooks, brackets, and faceouts. Whatever the case, Textured Slatwall or 3D Slatwall Panels will completely change your store and your customers will notice. 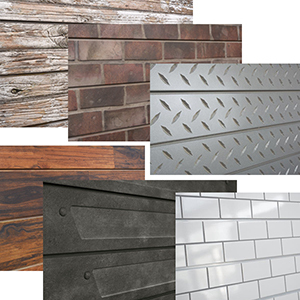 See our entire catalog of Textured Slatwall products here or call 1-800-426-5708! Note: All panels are made-to-order and ships in about 3 weeks, not including transit time. Rush services are available, check with your sales representative for details. Because these are made-to-order, there are no cancellations after the order has been confirmed.